Two misfits. One extraordinary love. It's 1986 and two star crossed teens are smart enough to know that first love almost never lasts, but brave and desperate enough to try. When Eleanor meets Park, you'll remember your own first love, and just how hard it pulled you under. A cross between the iconic '80s movie Sixteen Candles and the classic coming of age novel Looking for Alaska, Eleanor & Park is a brilliantly written young adult novel. Eleanor has just moved back home, a small shoebox of a house. She lives with her submissive mother, four siblings and an abusive, alcoholic step father. After her step father kicked her out the first time, Eleanor was forced to stay with practically strangers, on their couch, for an entire year. Now she knows that if she wants to stay with her siblings, she needs to live her life on eggshells. Starting a new school is daunting, the school bus is even worse. The only set available is next to a weird Asian kid. With Eleanor's large frame, bright red hair and freckles, she's an instant target. The kids in the back of the bus are on a mission to make Eleanor miserable, except the boy she shares a seat with, Park. First they share a comic book, progressing to gentle hand touching, then awkward conversations. As their relationship blossoms, Eleanor knows she can't tell Park her secrets, how she doesn't own a toothbrush, how her mother sides with her step father, how her brother is made to sleep in the basement or how someone keeps writing sick and obscene sexual comments on her school books. Park is her life, if he can't handle the truth of her shattered life, how will she breathe without him? 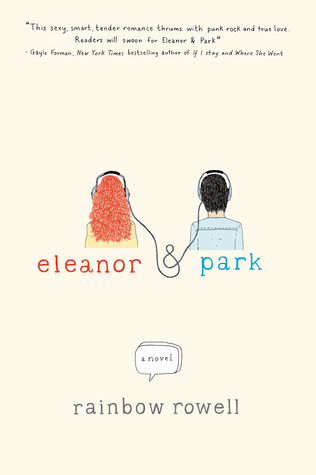 I was completely engrossed with the story of Eleanor and Park. A beautiful coming of age read about two teens from completely different worlds, finding a tender love with one another. Eleanor's life is heartbreaking and terribly realistic. A self conscious girl who holds her head high and marches to the beat of her own drum. Park is the quiet achiever, who doesn't know where he fits in. But I only wish it ended with an epilogue to complete their beautiful story, they deserved that much.